Facebook has added some new signals to the news feed algo… and while they say it will have little affect on Facebook Pages and marketers, it actually will – especially those who write pretty short articles and those who are very prolific with content that is shared a lot. 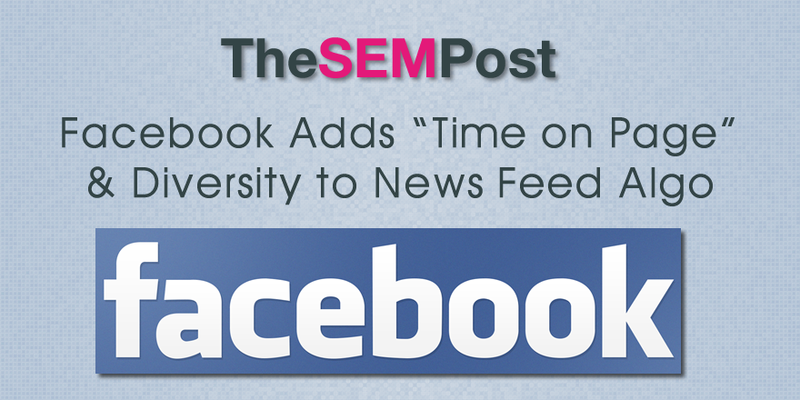 Facebook is now bringing the time a Facebook user spends on an article or page into their news feed algo. So if someone doesn’t spend much time on the page, it will show up less frequently to others. While this might not seem like a big deal, if you are a content publisher that frequently shares articles that might only be a few paragraphs in length, Facebook could take the short amount of time it takes to read that content as a signal that people are leaving the page quickly. They do say that they will use a threshold so longer articles are not treated preferentially, but nothing about shorter articles being treated similarly. Facebook is not taking load time into account… yet. This is smart since some web developer would surely think about using load time to game this part of the news feed algo. We have all seen it happen in our Facebook feeds where one site ends up getting a lot of shares for a variety of articles in a day, and all those articles tend to show up in a row in our news stream. Well the new Facebook news feed algo changes will reduce the likelihood of this happening. This means, if you tend to post a lot of your site’s articles on your Facebook page each day, that the likelihood all of those will be seen now will be greatly reduced. If your site only posts a handful of articles per day, this likely doesn’t happen very frequently, but if you are more prolific and post many articles per day, and around the same topic area, you could see the number of posts getting free news feed exposure reduced. But for sites posting more than a couple articles per day and for those publishers who regularly post shorter articles, those Pages could definitely see a drop off in their organic exposure on Facebook.